If baby ain’t happy, ain’t nobody happy. I’m pretty sure that is a truism on any family trip. 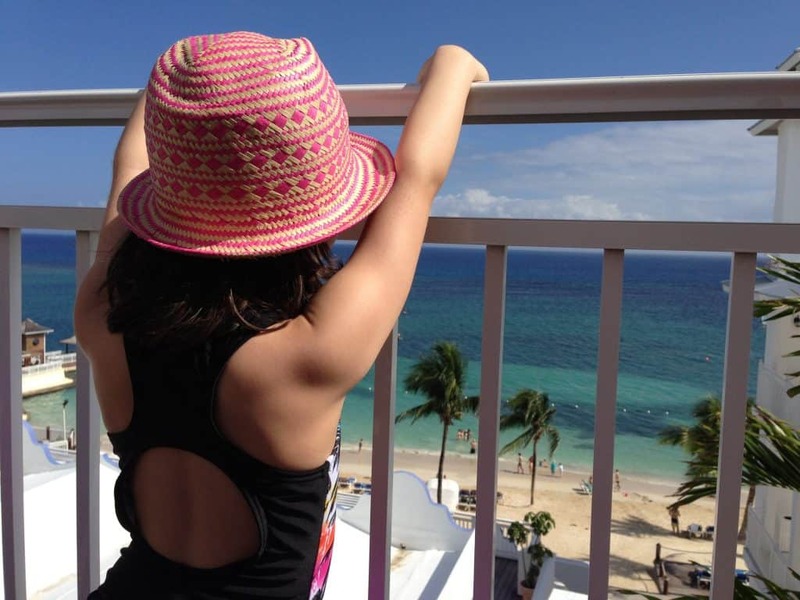 On the other hand, if your children like their hotel or resort on vacation, their happiness is contagious. Bearing that thought in mind, I asked some of the world’s best family travel bloggers what their kids considered their favourite hotel. With so many great responses, I’ve decided to split this list in two to make it more manageable. This list contains 15 hotels from North America and the next will contain 10 from the rest of the world. 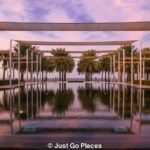 Hopefully this list inspires you to try some new hotels for your next trip that you may not have considered! The best hotels know how to balance opportunities for activity and relaxation. 1 What Do Families Look For in Child Friendly Hotels? What Do Families Look For in Child Friendly Hotels? I attended a panel discussion where a group of travel professionals sat around talking about how to attract high spending families to their hotels and resorts worldwide. Scintillating conversation, I know. Family trips are 1/3 of the travel market. So, what are hotels and resorts doing to attract family travellers? According to the professionals, high spending family travellers (i.e., you) are looking for more than a kids’ club to dump your kids while you relax by the pool. Instead, you are looking for a hotel where you can spend time both together and apart. You also want to try fun, new activities with your kids. The key though is to strike a balance between activity and relaxation. You also want your kids to feel welcome and special at your choice of accommodation. Remember, our special little snowflakes need to have attention paid to them on holiday, too. To further the discussion, I thought I would ask well-traveled kids about their favourite hotels and resorts. I found that the market research is right. All of these recommended family accommodations have something special that sets them apart. Whether it is a small or big thing – anything from a s’mores making kit to an amazing pool complex – that ‘x’ factor makes the holiday memorable for kids. 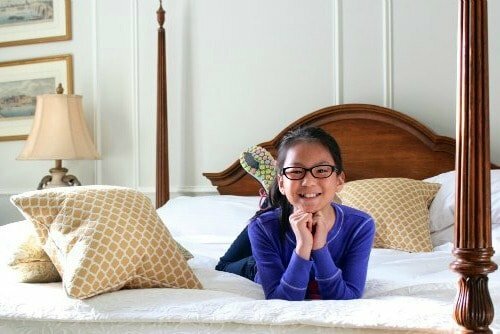 What makes a child-friendly hotel special for kids? Our seasoned young travellers tell us. Not surprisingly, the hotels and resorts that the children of these top family travel bloggers have chosen are a varied bunch. In all honesty, I can tell you from personal experience that there is no accounting for kids’ tastes. My kids are obsessed with Fowey Hall Hotel because it had a zip wire outside their room and the Four Seasons hotel in Dublin (now the InterContinental) because they got cookies with their names written on them. “It is often the little touches that make a place special for kids and, in this case, they came in the form of rubber duckies! We got to the Chelsea hotel in Toronto in the late afternoon and the ingredients for a major meltdown were stirring: the kids were exhausted after the long haul flight, we were ourselves jet lagged like never before and the line at reception promised to keep up standing for at least half an hour. 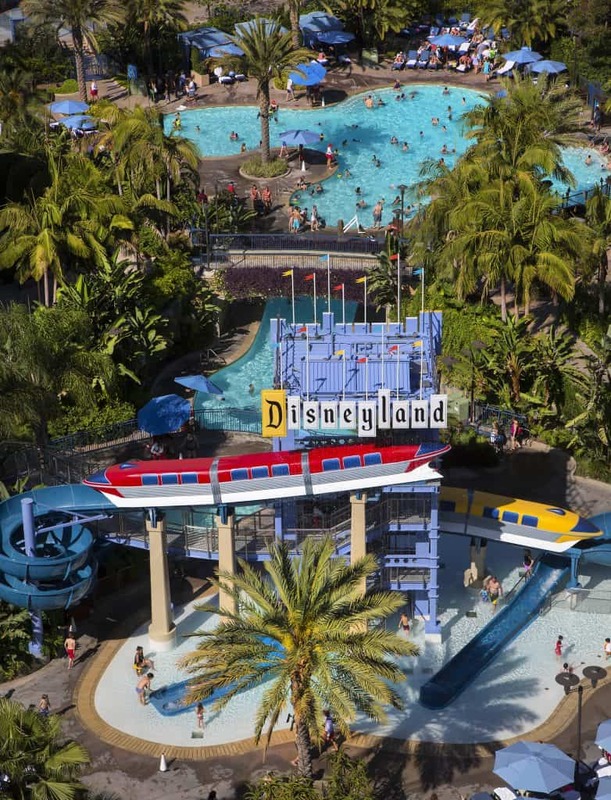 “The incredible Monorail Pool and light-up, musical headboards are the most memorable treats for kids at the Disneyland Hotel in Anaheim, California. In addition to the more traditional D-ticket pool area, kids will love zipping through a waterslide decked out to look like Disney’s Monorail. Kids delight in pressing the button on the bedside to make the musical headboards come to life with twinkling lights and the tinkling sounds of, “When You Wish Upon A Star.” Worry not, the song is short but sweet…if you can get children to stop clicking the switch! The Disneyland Hotel keeps the magical feeling of Disney alive without hitting you over the head with cartoon-y decor. Standard rooms are decorated with subtle Disney elements. Look for Mickey Mouse-shaped faucets, white-on-white Mickey-patterned duvet covers, and royal blue fireworks-inspired coverlets. 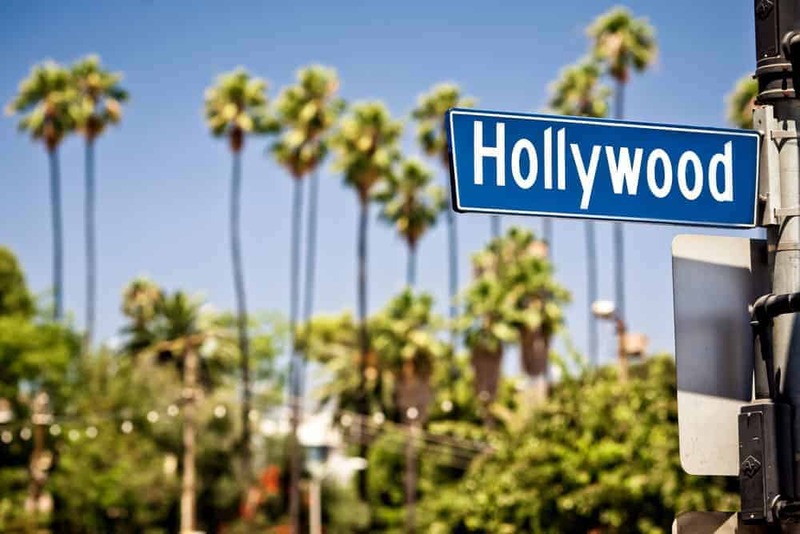 “Looking to spend a few days in downtown Hollywood? The Magic Castle Hotel is the perfect base for exploring the area. We stayed here the first two nights of a California road trip and my kids absolutely loved it! The Magic Castle is located centrally in Hollywood, Los Angeles. 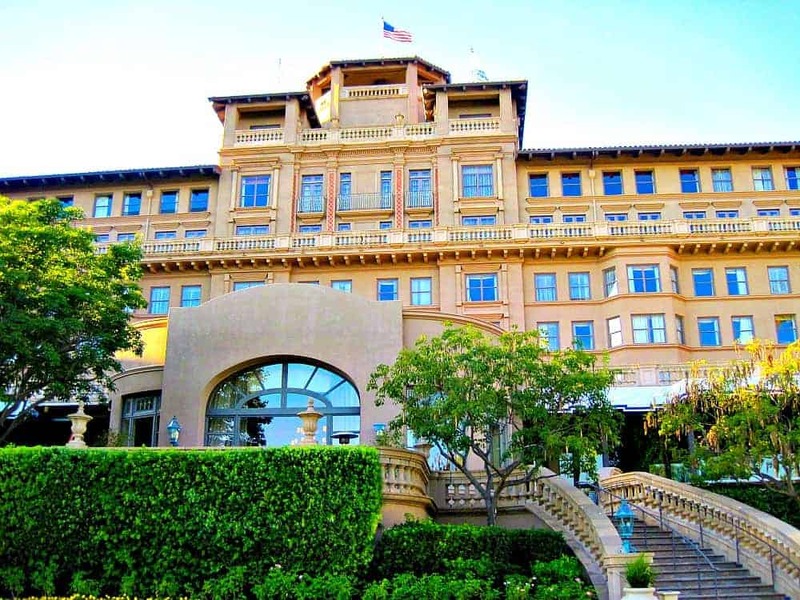 “We have stayed at many wonderful hotels over the years, but my son’s favorite hotel to visit is the luxurious Langham Huntington in Pasadena, California. We have shared many family adventures here, with wonderful memories of family and friends. Once, while visiting with his friend Nolan, he had the chance to ring the antique railroad bell from Henry Huntington that is rung at 7:05 p.m. Another visit we watched a traditional Indian wedding take place on the front lawn from our bedroom window. The first time we stayed at the Langham Huntington, my son marveled over the grandness of a building that looked more like a palace than a hotel. In our room, my son quickly discovered the enormous marble bathroom with shower and separate soaking tub. Every time we visit the Langham Huntington, he makes a point to take a bubble bath in the soaking tub. My son enjoys the pool and grounds of the Langham Huntington, especially the Japanese garden with Koi pond. His all-time favorite activity, however, is the afternoon tea in the Lobby Lounge, served on antique Wedgewood china. The first time we had afternoon tea at the Langham, he was annoyed to be doing such a “girly” activity but one sip of the vanilla tea and a bite of one of the scones quickly changed his mind. From that point on, a visit to the Langham Huntington is not complete without a seating for afternoon tea. 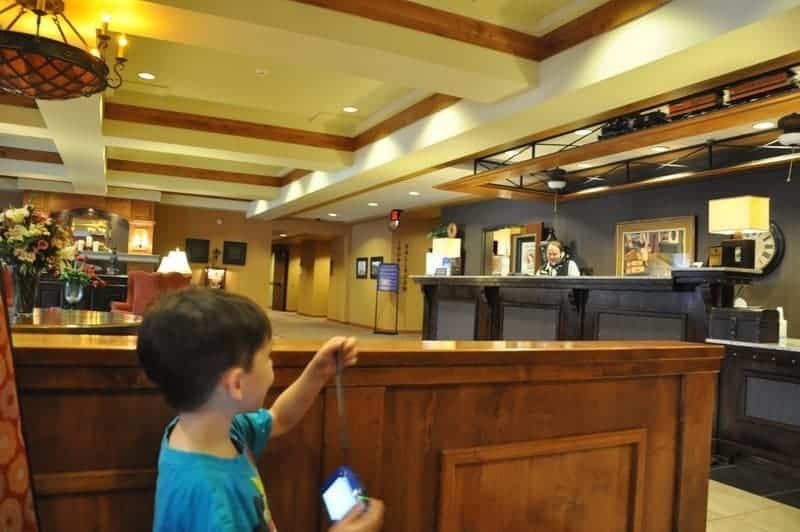 “I had been a long-time fan of The Broadmoor, a resort in Colorado Springs, when I brought my grandkids for the first time. As we entered the gates of this sprawling 1918 resort with its towering turrets, my then four-year-old granddaughter said, “Welcome to my princess land, Grammie.” I agreed that these definitely might resemble a castle to a preschooler enthralled with a storybook world. Perhaps the only missing structures were a drawbridge and moat, but she didn’t seem to notice. Surrounded by the mountains and framed by Cheyenne Lake, the historic Broadmoor Hotel is just 90 miles south of Denver. This historic resort sits on 3,000 landscaped acres with splashes of brightly-colored flora and manicured lawns. During the holidays, it’s a winter wonderland with festive holiday lights and immense gingerbread villages. 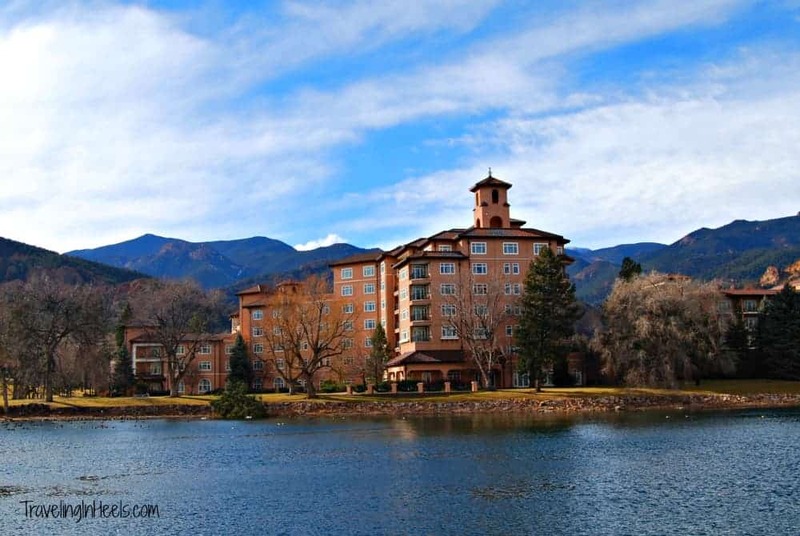 For families, The Broadmoor is a mecca of things to do including swimming pools, slipper slides, paddle boats, fishing, hiking, biking, horseback riding, and more. 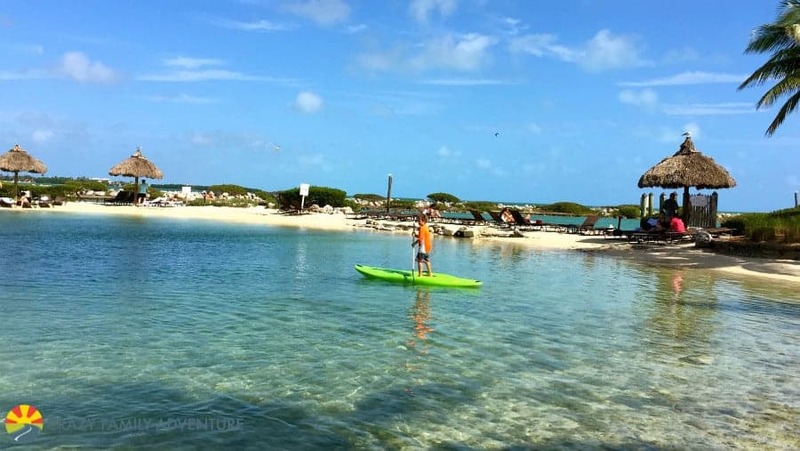 “Hawks Cay in the Florida Keys is one of our kids favorite hotels! We spent all day playing on the pirate ship splash pad, jumping in the pool, and playing soccer on the huge soccer field, playing basketball, ping pong, and miniature golf. They also enjoyed the 2 story townhouse we stayed in that had multiple balconies and TV’s. We started our next day at the delicious breakfast buffet where the kids made waffles covered in whipped cream and ate as many pastries as they could. Then headed to the cove area where they enjoyed paddle boarding and snorkeling in the calm ocean water of the cove. They also enjoyed watching the dolphins and swimming in the main resort pool before ending the night with a kiddie cocktail around the firepit. “My kids are with me as I feature five star-hotels and resorts, the focus of my site, and they have become true connoisseurs of kids’ clubs. They absolutely love a good kids’ club, and the Four Seasons Orlando is their favorite. Despite the property’s location in the Disney World resort, the Mouse has little to do with their love. The kids’ club at the Four Seasons is complementary for guests, and my kids start taking off into a run once we set foot outside in the pool area. 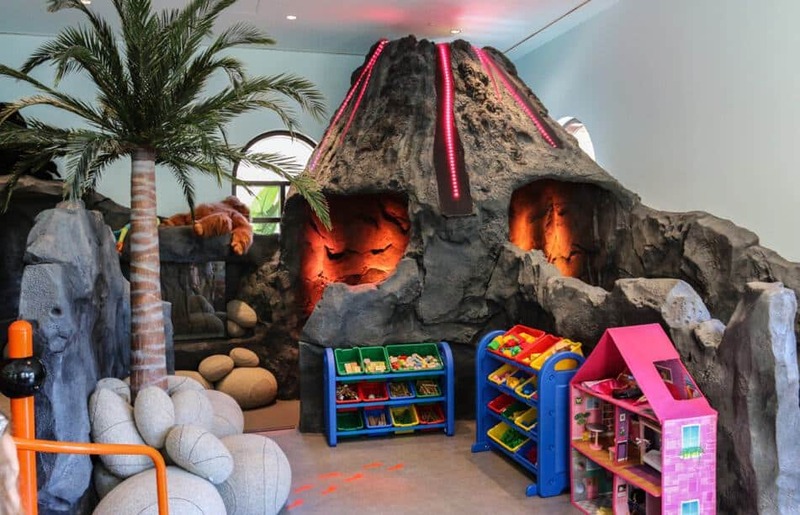 There is a volcano structure in the kids’ club that erupts with a red light show and audio soundtrack every time the kids push the hidden button, and they think this is the best thing ever. 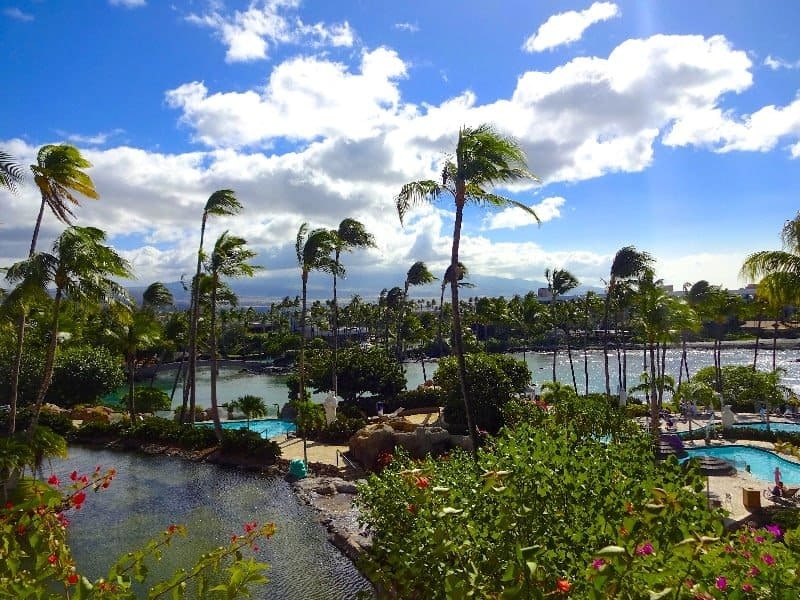 “The spectacular mega-resort on Hawaii’s Big Island, the Hilton Waikoloa Village, is our family’s paradise! Set among the most stunning scenery in Hawaii, we could have spent days without ever leaving this gorgeous property. The resort offers all sorts of family-friendly adventures: multiple pools, ultra-fun water slides, lagoon activities, mini-golf, and even some entertaining classes on Hawaiian culture, such as dancing and lei making. The restaurants are delicious and very family-friendly – we loved the casual Lagoon Grill overlooking the dolphins and the gourmet foodie heaven at the Kamuela Provision Company (book on the lanai at sunset – perfection!). “Maui isn’t just a honeymoon destination, it’s a tropical family friendly paradise perfect for kids too. 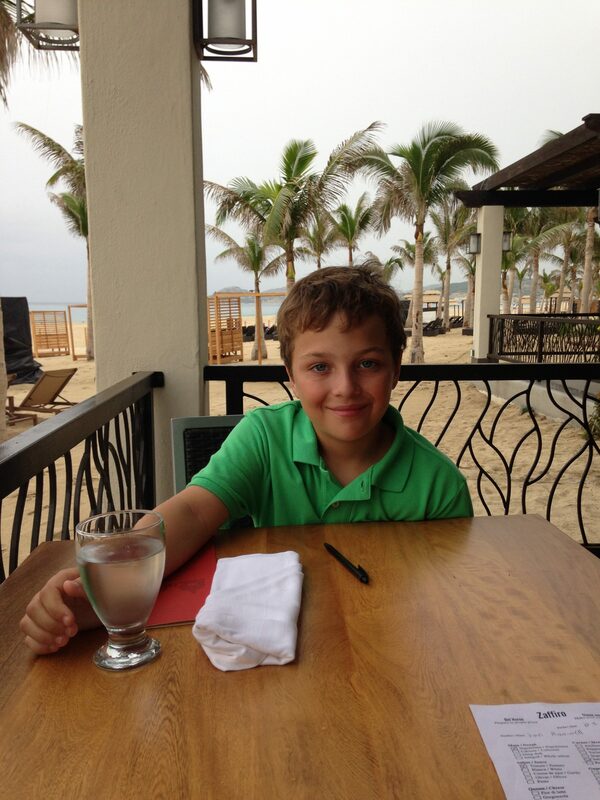 My son Harry’s favorite resort of all time is The Grand Wailea Maui. I don’t always agree with my 6 year old little boy on everything, but in this case his favorite resort is also our family favorite! Harry loves to be pampered and teated like a special guest when we travel and The Grand Wailea treats kids like VIPs. What kid wouldn’t love a resort that welcomes them with Leis, POG (passion fruit, orange, guava juice) and goodies to enjoy in the room. 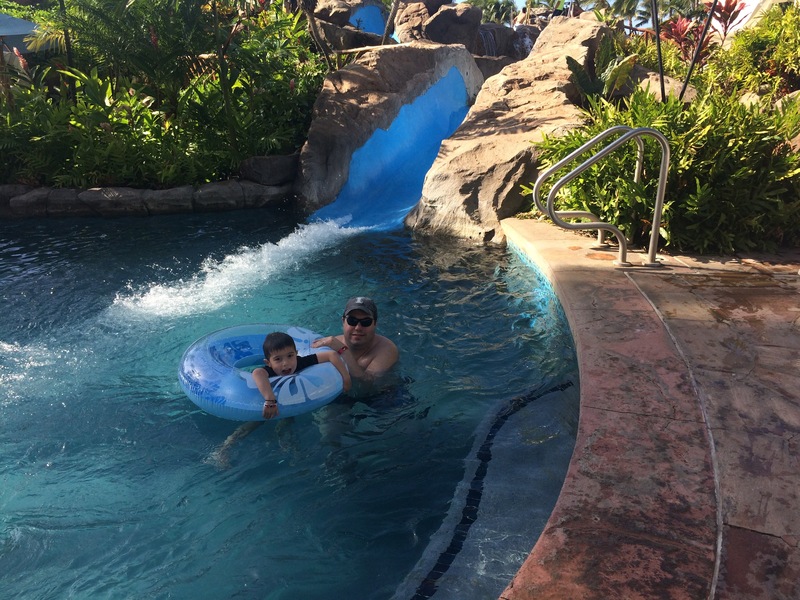 The Grand Wailea has everything a kid could ask for including breathtaking beaches to play in the sand, rooms with huge lanai’s that overlook the crystal blue Pacific Ocean, beautiful pools, awesome water slides, lazy river, kids meals served in sand pails, and a super fun kids club. We always stay in the Napua tower where Harry loves to help him self to daily breakfasts, snacks, and over-the-top nightly Hawaiian appetizers while we sip on their signature Mai Tais. During our last visit, Harry was wild about an inventive appetizer that the chef’s concocted with rice crispy treats and dry ice, a definite crowd pleaser with the kids. “My seven-year old daughter loves hotels with large heated outdoor pools. I have to say that she and I share a similar taste in this regard! No matter how busy we are in a destination, we find time in the afternoon to relax in a (heated!) hotel pool. Our favorite hotel pool we have experienced so far is an outdoor pool complex at Bellagio Las Vegas. It has several heated generous size pools and hot tubs, and the entire pool area is beautifully styled and has a look and feel of an Italian villa (complete with a café serving a very decent espresso!). The fountains at Bellagio in Las Vegas put on their show every evening. “When we checked in to the Sanderling Resort, the desk clerk told us to be sure to call the front desk before we went down to the beach so a staffer could set up chairs and an umbrella for us. I was instantly sold. We got to the room and found a s’mores kit for the outdoor fire rings the resort lights every night and my 7-year-old was hooked. For my husband the balcony where we had drinks every evening and coffee every morning clinched it. My entire family felt relaxed and taken care of and really loved this hotel. – Eileen Gunn at Families Go! 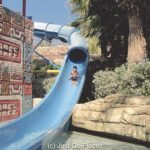 When I think of family friendly hotels, they often have great kid perks like water slides, fun dining options and maybe an ice cream bar or snack shop. Yet, when we stayed at Keswick Hall, a luxury resort in Charlottesville, Virginia, we discovered that luxe can be family friendly too. At first glance, the Italianate style architecture seems stuffy and formal — harkening back to the era in which the home was built. The staff, though, is anything but stuffy. On arrival, they greeted our daughter with a polite handshake and introductions. They gave her a stuffed dog, in honor of the estate’s resident hunting dogs. They presented her with a large brass key to her bedroom. After settling in, our son went to the lobby to ask about movies — and was astounded when the staff rolled a TV and DVD player into our room and hooked everything up. Later that night, after an evening in town, the kids were delighted to enjoy fresh baked bedtime cookies. Besides these special touches, the resort also has tennis courts, hiking trails, indoor and outdoor pools — kids loved them, golf, archery and more. Maybe the best of all, besides the friendly service, is the opportunity to walk the resort’s dogs. All in all, a stay at Keswick Hall is something beyond the ordinary — it’s a special getaway the whole family can enjoy. “Families looking for a property their kids will love, need look no further than the Hyatt Ziva resort in Los Cabos, Mexico. This stunning beach front property is a quick fifteen minute ride from the airport, which is appealing to families after a long flight. Upon arrival, families are welcomed by a stunning view that looks out over the pool area and to the Sea of Cortez beyond. 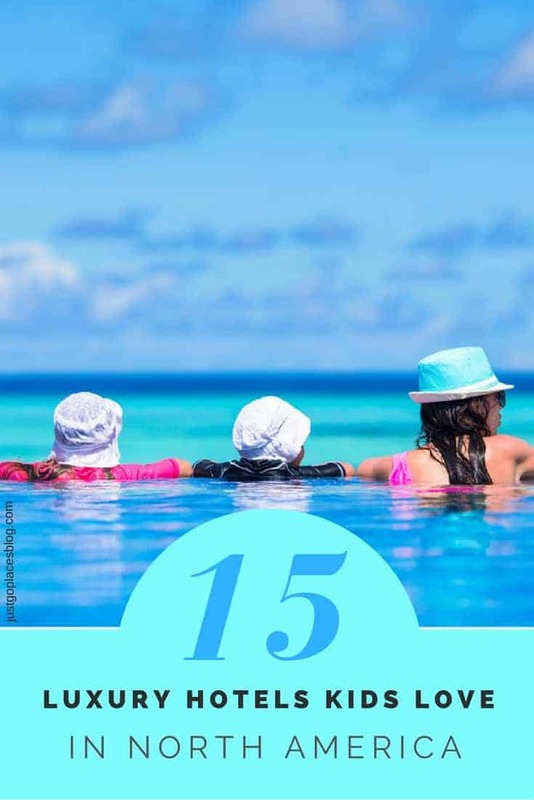 “Flitting among the water park, the arts & crafts room and the beach, my children were as happy as they have ever been at the Beaches Resort in Ocho Rios. This resort was also where they discovered swim-up bars where you can order cocktails. Swim-up bars are something that can spoil you for life! We had interconnecting rooms which was perfect because we also took our nanny on holiday with us. Every day was another day in paradise at a Beaches resort. 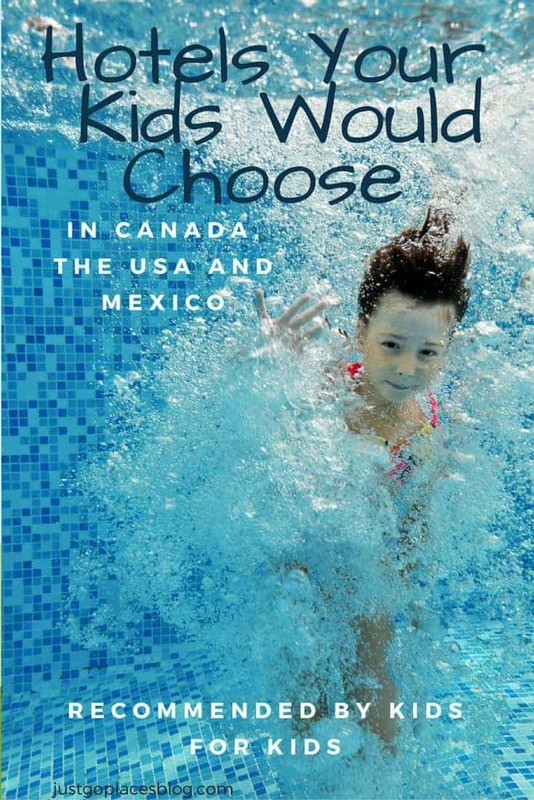 Our 15 child friendly hotels kids love in North America is heavily weighted towards the USA. In fact, Canada, Mexico and the Caribbean only feature one hotel each. What do you think of these choices? I would love to hear if you know any others you would add to the list. Have You Heard Of The Most Haunted Hotel in New England? Great post!! As a full grown adult (practically!) I feel like I would enjoy the musical headboards at Disney too! I had spent some time in Ocho Rios but I didn’t get a chance to check out their resort. I love the idea of plenty of connecting rooms and will probably look for one there the next time I go back with some friends. I love when there is a selection of connecting rooms. Some hotels advertise saying they have connecting rooms but they have only a couple which get booked up quickly. Great resource for family travel planning. 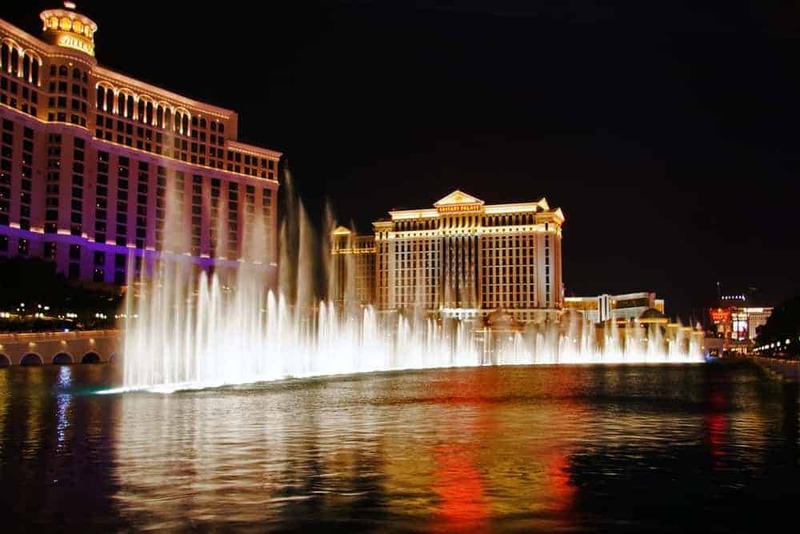 I was surprised by a few of these recommendations, such as the Bellagio. I would not have expected it to be so family friendly. Vegas really is trying hard to be family-friendly. People with kids spend more money in the city overall (not just the casinos) and obviously are not seedy. We went to Vegas and didn’t even go into a casino once. 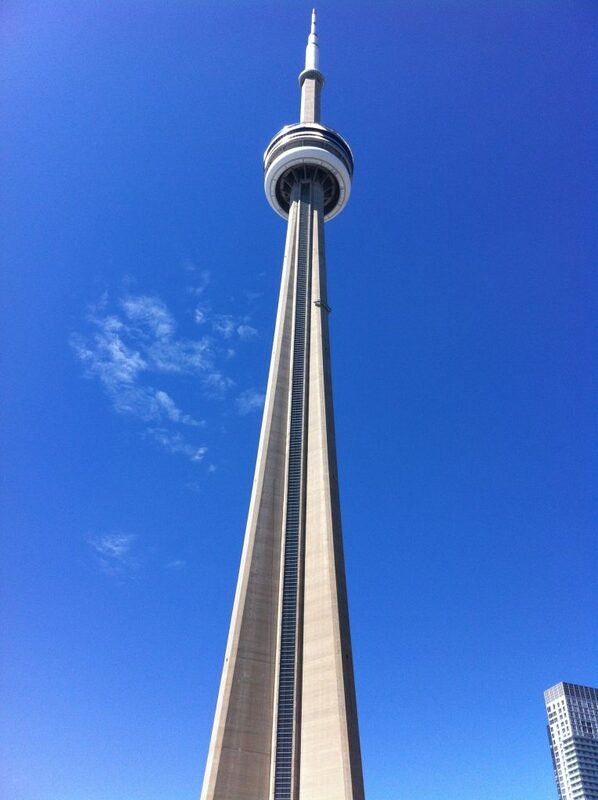 There were too many other things to do – aquariums, shows, restaurants etc. I’m so glad that the DLH made the list. It really is a wonderful place and I loved working there. The Monorail Pool is cool… but it used to be the Neverland Pool, which was awesome and a half! And the Broadmoor really is amazing! So glad to hear another family travel expert concur on these! Good to know that they change the pools around to update the look. This could be a great list for tourists planning to get there. I do agree that hotels have to be kid friendly to top in my list while searching in different destinations. The Swissotel in Zurich was one such choice, it did make a hole in the pocket though. good tip! I didn’t say good taste came cheap!! LOL. It’s hard to have everything. I can pretty much guarantee that my kids will pick something expensive. All of these sound amazing! The kids have excellent taste, obviously. Ive been a guest at the Magic Castle Show but have never stayed at the hotel. I would love to, though! It really does seem magical! These are well-travelled kids. They know what they like! 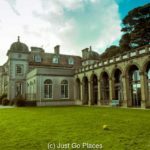 Though the kids have grown up, I still found these to be interesting properties to book a stay in! Yes, they are meant for everyone. So many people are doing multi-generational travel now. For example, brothers and sisters where some may have kids and others don’t. I don’t have kids but wow – what an incredible list. I would actually still be happy to stay at these places with or without kids. The one thing I really love about the US is their view towards pet friendly accommodation. 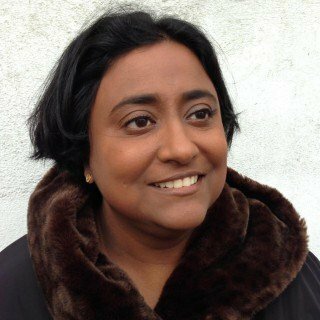 Great read Shobha. thanks Kerri! I do love when pets are allowed in hotels. In some ways, my dog is way better behaved than my kids os really if I were a hotel, it would be a no-brainer. A nice roundup of hotels for a family holiday Shobha. Your kids are so lucky to get the chance to travel widely at a young age. I’m sure it will give the a good grounding for later in life. You can’t beat Disneyland for family fun. They are definitely more tolerant of travelling now that they know each place will be different! Hats off to you for publishing this list and to have visited all these places. Some of these places (not the hotels) have been on my list for a while. Coming to the hotels, although I am not a kid any more, it looks like I might enjoy some of the hotels on this list. Thanks for bringing this out. I actually haven’t been to any of these places picked by the other blogger families except Hawks Cay (which my kids loved). I look forward to checking them out though. Outstanding list. 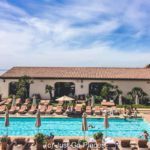 I love, personally, that I just included one of these hotels in my latest post—about how travelers can give back. Wonderful! I look forward to checking it out! These are great picks. I feel like any hotel that’s kid friendly is also going to be less pretentious as well! I’d add the Rittenhouse in Philadelphia. They have all these different things for kids (and cute touches like a little rubber frog in the bathrooms), like this cute Teddy Bear tea around the holidays. That’s good to know! I visit Philadelphia all the time but don’t know the hotels. My parents live in the suburbs so staying anywhere other than with them is a non-starter. You’ll love it! Such an easy place to visit. And, you’ll need a year because there’s so much to visit. What a great idea for a post – well done! We’ve personally only been to one – the Ziva Los Cabos – and it was spectacular. Kirsten is right on the money (as always). It’s a great hotel for families and they seem to have thought of everything. Now that you have this nice list put together, it’s time for us to get to work! I’ve not been to that one. Yes, I’m using this list for my own personal wish list too! Great information for family with kids. When will be in US, would definitely go for these hotels and I would prefer to beach resorts, as loved that view from balcony. Thanks for sharing.